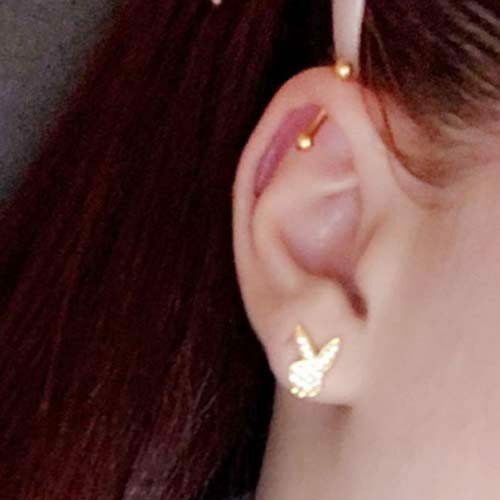 Danielle Bregoli wears a barbell piercing in her right forward cartilage. 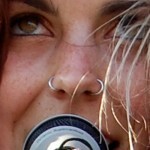 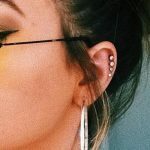 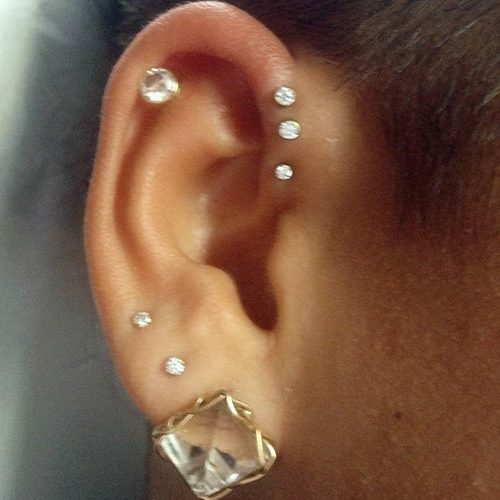 Cassie wears a total of seven piercings in her right ear: three in her forward helix, one cartilage piercing, two upper lobe and one lobe earring. 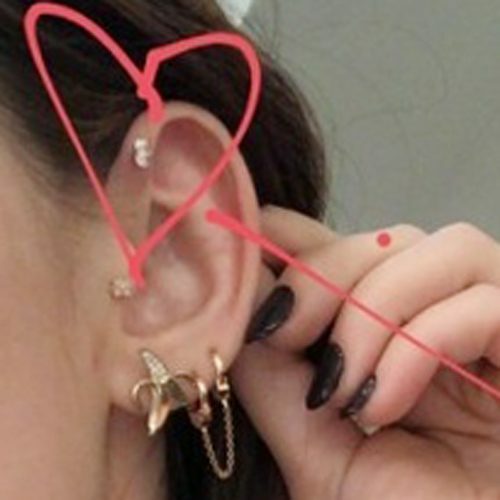 Behati Prinsloo wore a total of five piercings in her left ear: two studs in her upper lobe, and three golden hoops – one in her lobe, on in her cartilage and another in the forward cartilage at The LACMA Art + Film Gala in Los Angeles, California on Saturday November 4, 2017. 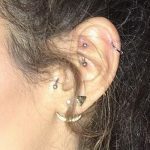 Scarlett Johansson wore a total of eight piercings (two helix cartilage piercings, one tragus, 3 stud upper lobe piercings, one forward cartilage and one earring in her ear lobe) at the Paris Premiere of the Paramount Pictures release ‘Ghost In The Shell’ at Le Grand Rex in Paris, France on Tuesday March 21, 2017. 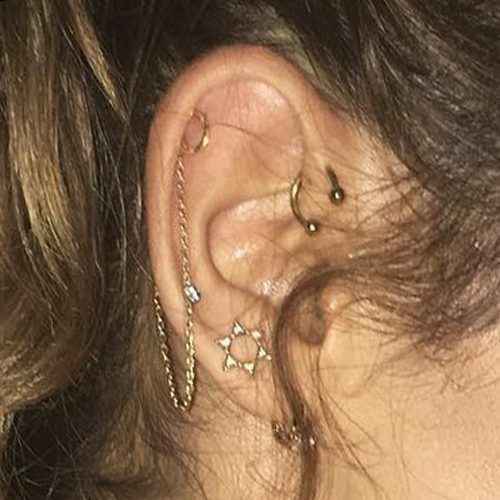 Chantel Jeffries has a cartilage piercing on her right ear which is connected by a chain to the back of her ear. 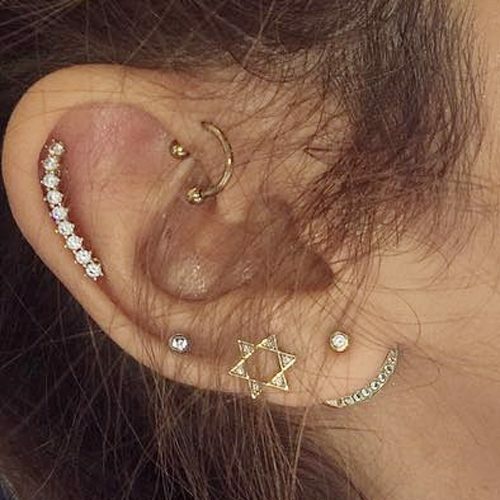 She also wears a circular barbell in her forward cartilage, a gold jeweled earring of David’s Star in her upper lobe, one tiny jeweled stud in her auricle and one jeweled earring in her ear lobe. 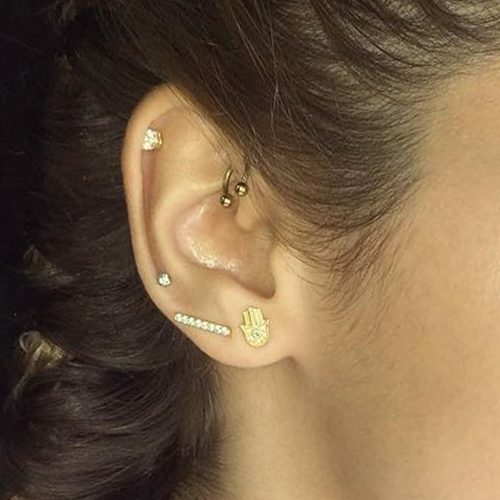 Chantel Jeffries wears a beautiful jeweled ear crawler in her cartilage, a circular barbell in her forward cartilage, a gold jeweled earring of David’s Star in her upper lobe, one tiny jeweled stud in her auricle and one jeweled back-crawled earring in her right ear lobe. 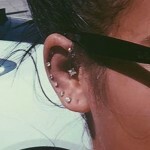 Chantel Jeffries wears a total of five piercings in her right ear: a gold Hamsa earring in her lobe, a small jeweled bar earring in her upper lobe, a tiny jeweled stud piercing in her auricle, another jeweled stud in her cartilage and a circular barbell in her forward cartilage. 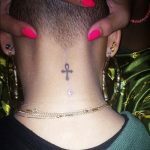 Cassie Ventura was wearing six hoop earrings all along the outside of her cartilage on her right ear, a gold button earring in her lobe and a forward helix/cartilage stud piercing at the Boys & Girls Harbor honoring Sean ‘Diddy’ Combs and his family at David Koch Theater in New York, NY on Monday September 26, 2016.